Here are some of my comments on string theory (posted on Physicsforums.com). Can't gravity be the only force? Seen as restructured spacetime. The ripples of spacetime can then couple to knots and become local unities with multi-layers of spacetime. Local friction between oscillating ST-layers can create then other (local) oscillations and new couplings which we observe as TM, EM, strong and weak forces. If you have not checked the NOVA TV-program on String Theory please take a look to this link for the streaming downloading. I must say I was really impressed by the visual 'show'. ;-), Greene was a real movie star, smiling and turning with his eyes ... yes almost a SF-movie or 'sliders'. But what was did I learned? I learned that non of these experts knows what strings are supposed to be and that there is lack of a general design behind. I presume that they give there best shot in this show and these experts really gave the essence of their thinking without the mathematical frame work. I saw that now the Brane worlds are fundamental issues on which open-end strings tie down to, but that there are still closed strings - being the gravitons - which jump of the 3D-membrane. So we have essential three separate elements: (A) the brane(s) (represented even as separate floating particles), (B) open-end strings (glued to a brane and moving over it), and (C) closed-strings representing gravitons which have to end to tie down. The branes can also been seen as slices of bread (bringing parallel universes), and they can even contain a whole galaxy. Now also there must be (D) 'sparticles' (another type of more heavy strings) to respect supersymmetry. Closed Strings leaving a brane.These represent the gravitational forces! Now if this is the todays vision of reality I think it a very schizoid reality. I see a lot of magic. I see no logic line, nor conceptual thinking. The aim - of these all very sympathetic people (especially I like the soft voice of Witten!) - is 'unification' ... but the presented concept is still based on 'separation'. Schizoid. Cut in pieces. 1. Have you ever heard the 'sound' of an un-connected violin string? I mean a string that is NOT connected to the wooden violin body? No sound, nor vibration at all! But in string theory that's a basic way it goes. 2. Separation means that you have to explain how the separations happens (what makes the actors different?) and HOW do they interact? 3. What mechanism makes the gravitons leave the brane? 3. What made the difference between a closed end and an open-end string started from a down view? From a united system there must be a condition which made them different. 4. Now if you separate normal open-end strings on the brane they must be linked also to gravity. So how is a closed 'graviton' string that left the brane still connected to that open-end string. By a mobile phone? By the mirroring cigam-approach? That's not good. 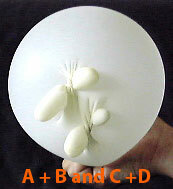 Unification means that A, B, C and D must be one. Unification means that all next 'following' steps must have a causal and logic mechanism. Occam's razor doesn't allow to work with uncertainties. The Standard Model works also with causal building up of our 3D-reality but has a number of not understood interactions. But SM is in it's fundaments logic and causal. Now for sure you can give all type of fantastic mathematical explanations for the separate actors in String Theory but they are not united at all. ST experts look from below upwards instead of looking after concepts that start from top and which MUST explain all that happens later. So what is the point of String Theory? NOVA: What is the nature of those gravitons? Gates: Einstein's equations describe how space and time are curved. The analogy is that the universe is like a sheet of rubber, and when you put a piece of mass some place, it dents the rubber and causes things to fall in, and that's analogous to how gravity works. Now, if you were to take that mass that you dropped on a sheet of rubber and jiggle it back and forth, what would happen to the sheet of rubber? Very quickly you would build up ripples on the sheet of rubber as you take the mass point and jiggle it back and forth. Those ripples are in fact the graviton. So it's the waves of gravitational energy in spacetime that are responsible for communicating the gravitational force. Pelastration: So if a string is restructuring of the spacetime, meaning: a local coupling of two spots of Spacetime, you get a specific 'joined' zone of spacetime with a 'unique' vibration (which is different from the general vibration). From chaos a new discrete zone is created (as long as it holds). IFF some hold then the can couple with each other creating a higher. NOVA: It's become a cliché that Einstein was a genius. What was it about the way he approached problems that made him such a genius? Gates: Einstein made the statement once that imagination is more important than knowledge. For a long time I was very puzzled by this statement. How could it be that imagination -- which I associated with play fantasies and hobbits and such matters -- how could it possibly be that that was more important than knowledge? Now, having worked as a physicist for over two decades, I think he was saying that when you try to create new knowledge, the only tool we have as humans is our imagination. The creation of new rational paradigms is itself an irrational process. The genius of Einstein was such that when he wrote down his marvelously complicated equations of general relativity, he gave a picture for what the equations meant, and why they had to be. Suppose you were in an elevator standing on the surface of the Earth and had a ball in your hand. You let go of the ball and it falls. You wouldn't think very much about that because that's how gravity always acts. But suppose that I take you in this elevator with no windows so you can't see out, and I put a rocket motor under it and I put you out in space. Then I turn the rocket motor on so that it causes the acceleration to occur within the elevator. You're moving faster and faster, and you're standing on the floor of the elevator and you have this same ball in your hand, and you let go. Gates: In our world as we observe it in the laboratory, the universe breaks into, roughly speaking, two pieces. One of these pieces is matter, such as electrons, quarks, protons, neutrons -- what things are made of. The other half of our universe are the things that cause the matter to clump together -- the forces of nature -- and each force has carriers. The carrier of the gravitational force is the graviton; the carrier of the electromagnetic force is the photon; the carrier of the strong force are things called gluons. Well, gee, what kind of unification is that? The answer is, it's no unification at all. 1.The carrier of the gravitational force is the graviton; which is the elastic property of spacetime. The more layers you have locally the less elastic it will be, and the more concentrated tension. 2. The carrier of the electromagnetic force is the photon; then the photon is a 'particular' zone with a few layers and a high elasticity (capable to high velocity), but limited by the stretchability of it's ST layers (300,000 km/sec). So the speed of light indicates the hidden factor of the stretchability of basic spacetime. (Example iff a photon would have "only" two layers AND iff a simple multiplication would be applicable then the basic stretchability of Spacetime would have a velocity limit of C^2. ). The carrier of the strong force are things called gluons; then the gluon is a 'particular' zone with more spacetime layers then the photon and has thus less local elasticity. Gates: So let's try one more marriage. Let's look for a marriage where the stuff of our universe and the things that cause the stuff to clump together are intertwined. We know this occurs in string theory, but it also occurs in a smaller theory called supersymmetry. That's the first place we saw this marriage occur, and that's in fact what brought me into theoretical physics. In a supersymmetrical theory, there are new forms of matter and energy called "superpartners" that are required for this unification. NOVA: What do you see as string theory's greatest failure? Weinberg: A disappointing aspect of string theory is that it has so far failed to shed any light at all on what is probably the biggest outstanding problem in the physics of what we can actually see in nature -- the failure to understand the energy of empty space, the so-called cosmological constant. If you try to calculate the energy in empty space, taking into account only fluctuations in fields of wavelengths where we understand the physics, you get an incredibly large energy, much too large to possibly fit what we know about the expansion of the universe. There must be some complicated cancellations that make the energy in empty space very small. String theory provides not the slightest shred of insight as to why the energy of empty space is as low as it experimentally seems to be. And that's precisely the kind of thing that one would think string theory would be able to help with. I'd say that's the biggest disappointment so far, that in the one area where you might expect some kind of quantitative general idea to come out of string theory that might actually be useful, it has failed to provide it. Pelastration: The basic spacetime brane has two sides. So conceptual you have on each side of the brane the reversed movement of the oscillation (cfr. waves in a moving table napkin). If ripples couple on side A to a local new doubled layered zone ... it has a deformational effect on the other side (B) of the brane. Now on side B the spacetime peaks can also couple! That will influence the couple possibilities on side A. Now if our 3D world is on the A-side (i.e. the RED Universe) then we have no way to understand what happens (building up) on the other side of the brane (the BLUE Universe) .... but we will feel it's gravitational effects! Maybe we will call that Dark Matter or Dark force. Gross: The big bang theory is the idea that if we go back early enough in the history of the universe -- and we can do this, of course, by looking at starlight coming to us from billions of years ago -- we will see a very hot and dense period where the universe was much smaller, denser, and hotter. And that explosion or hot state left remnants that we can observe today in the microwave background. So we know that that aspect of the theory is true. If we push back even farther, that hotter or denser state becomes even hotter and denser. And if we extrapolate using Einstein's theory of general relativity, we find total disaster. That is, we find a singularity, in which the forces that act on particles become infinitely strong. Things break down completely, and the theory no longer makes sense. Our conclusion is not that the universe doesn't make sense, but that the equations are wrong. They're applicable maybe at later times, but they're not applicable at the beginning of the universe. So we desperately need something like string theory appears to be -- a theory that is consistent. NOVA: Basically you need a theory that's going to work under those conditions. Gross: Yes, and one that can provide an answer to questions that with our present theories we can't dream of answering, such as: How does the universe begin? What starts it off? What is the state of the universe at the beginning? Is that unique or arbitrary? Who fixes the initial conditions? There are questions that can't be answered within the standard theory. We're not sure that string theory, or any theory, could provide answers to the beginning of the universe, but it's a goal that many of us are desperate to try to reach. NOVA: When you say physicists don't understand string theory, what do you mean? Gross: One of the strangest aspects of where we are in string theory after 35 years is that we don't really know what string theory is. There are all these people working on string theory and doing wonderful things, sometimes answering old problems, sometimes coming up with new scenarios. But if you really ask them, "What is string theory?" they'll give you a glib remark, a glib description, and describe certain of its aspects. If you ask them again, "What is string theory?" if they're honest they'll say, "Well, we don't know." We have this incredibly powerful set of tools and methods that describe this intellectual structure, and yet we really don't know what lies at the core of that, what the unifying principles are, what the theory actually is that has all of these different aspects that we can partially describe. Pelastration: So there is no basic design or ... even not an idea of a concept. In our approach there is a simple engineering mechanism that confirms (or predicts) the most essential elements of GR, QM, String and SM. Witten: In Einstein's general relativity the structure of space can change but not its topology. Topology is the property of something that doesn't change when you bend it or stretch it as long as you don't break anything. You can imagine a bowling ball and you can imagine a coffee cup that has a handle -- the coffee cup is different topologically because there's a handle. Even if you could bend it or stretch it, as long as you don't break it, it's still got that handle, which makes it topologically different. There was a long history of speculation that in quantum gravity, unlike Einstein's classical theory, it might be possible for the topology of spacetime to change. And it turned out in string theory in the late '80s and early '90s we actually were able to calculate examples where you could really see changes in the topology of spacetime. That was fun because it was very concrete -- you could understand it pretty well. And it illustrated how the theory went beyond Einstein's general relativity as understood before in a very nice and down-to-earth way. Witten: Quantum mechanics brought an unexpected fuzziness into physics because of quantum uncertainty, the Heisenberg uncertainty principle (HUP). String theory does so again because a point particle is replaced by a string, which is more spread out. And even though it's a naïve statement, it leads in the right direction: when we study it more deeply, we find that in string theory, spacetime becomes fuzzy. Pelastration: Now such statement: 'That fuzziness of spacetime leads to the possibility that the topology can change." is of course complete non-sense!!! In fact it says: Due the unexplainable CHANGES ... we will have ... CHANGES! So in String Theory spacetime becomes fuzzy. 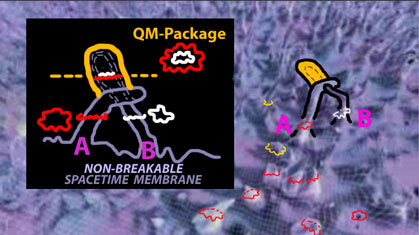 Now if some of those fuzzy spacetime parts (just jumping in QM) might couple locally you get also a quantum package (with unique properties ... like we see in the various particles of the Standard Model), and tha's what pelastration is about. Pelastration: In our approach we get that each discrete zone has multi-layers of spacetime. We can see those as other dimensions. You can visualize this as the Russian dolls. But each doll has a number of hidden dimensions which are combined inside the doll and connected with the previous dolls. So when you take a doll out the other will follow since they are connected. Witten: If I take the theory as we have it now, literally, I would conclude that extra dimensions really exist. They're part of nature. We don't really know how big they are yet, but we hope to explore that in various ways. They're beyond our ordinary experience just like atomic nuclei are. On the other hand, we don't understand the theory too completely, and because of this fuzziness of spacetime, the very concept of spacetime and spacetime dimensions isn't precisely defined. I suspect that the fuzziness of spacetime will play more of a role in the eventual answer than we understand now. In String Theory and Quantum Mechanics the Uncertainty principle rules! And spacetime can be splitted and teared like a piece of paper. In Pelastration Theory spacetime is undestructable and almost infinite stretchable.There is a simple and logic hierarchic building up. A excited jumping Spacetime (being Prior-Geometry) can couple to holons, which can also be called Quantum packages. (see the animated gif of such creation). 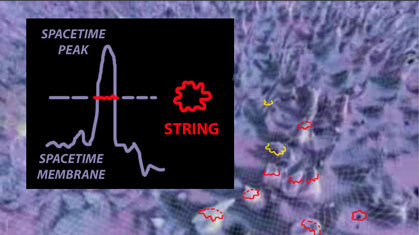 In my opinion strings are the mathematical expression of the peaks of the spacetime membrane. 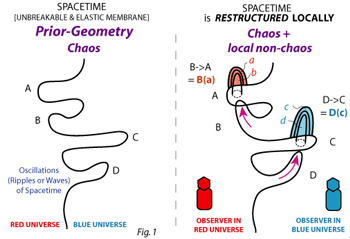 If the spacetime membrane is non-breakable then Quantum packages (QM baskets) contain two different values of spacetime which are combined (joined), thus in String/brane theory terms: two parts of brane coupled. This coupling happens with a penetration (pelastration) of one part of spacetime by another part.